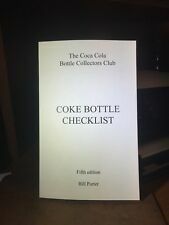 5TH EDITION Bill Porter's "COKE BOTTLE CHECKLIST"
"Old Coke Bottles- A new Look! Lists every script bottle known from early aqua and amber straight sides to 1915,1923, Pat.D, and embossed 61/2 OZ. LOOK >>> Just released 5th Edition ! Includes all ADDITIONS CORRECTIONS AND UPDATES INCLUDING. I won't list anything that I wouldn't use myself. Normal wear for a used item should be expected. Condition : The book is in very good condition with only minor wear to the cover. The inside pages are clean. There are about 63 pages and many hand-drawn black & white illustrations. 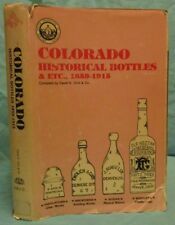 Colorado Historical Bottles & Etc. 1859-1915 by David Clint. No highlighting or underlining. Dustjacket is not clipped (no price), has minor edge tears and creases, old sticker on spine. Front flap has been reattached with clear tape. 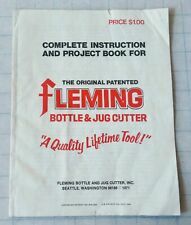 1971 complete instruction and project book for the origional Fleming bottle cutter. I remember from the 1070s wind chimes made from circles of colored glass. A wonderful sound. This is the 1967 softcover Book “BOTTLE COLLECTOR'S HANDBOOK & PRICING GUIDE” by JOHN T YOUNT. You can see the contents on the cover. This has 89 pages. The book would be in okay shape except for the fact that the corner was gnawed on by a small dog. Found in an old factory before it's demolition in West Allis Wisconsin USA several years ago. because. What you see is what you get. Book in photo is the book you will receive. Antique Ohio Qt Pt Milk Bottle Club Diary Reference Book Out Of Print ??. Condition is Like New. Shipped with USPS Priority Mail. 256 pages which includes prices and descriptions for Ohio milk bottles. Lists 6586 diaries from Ohio only. Original as found with light storage wear and some corner wrinkles but not many. Please let me know if you have any questions! (A Comparative Price Guide for Bottle Identification laid-in! Co.; Salem, OR). Putnam, Hazel Elizabeth, 1908-. You can also arrange for Local Pick-up if so desired. identification, by H. E. ABCDEFG [by] H. I. JKLMN / 1st Ed. AUTHOR: Doris and Peter Unitt. TITLE: BOTTLES IN CANADA. CONDITION NOTES: VERY GOOD/GOOD Dust jacket solid but stained and torn on edges. Also included are bottles by Wild Turkey, Lionstone, Potters, Kontinental, Daviess County, Poncho Villa, and Louis and Clark. We've even included the complete line of Dugs Nevada Brothels. We specialize in price guides and reference books for the antiques and collectibles industry. THIS IS AN OUT OF PRINT, SOFT COVER, SUPER REFERENCE BOOK PUBLISHED IN 1987. Bottles from the Deep by: Ellen Gerth. You won't receive heavily thumbed shelf copies from us! We buy most titles directly from the publisher and individual authors. Authors are encouraged to submit their reference titles for our consideration. The Official Bottle Price List by Ralph & Terry Kovel. Color and B&W Photos. 253 Pages. I often have more than one book available for each topic. Item in pictures is item you will receive. Here is a lot of 11 issues of PICTORIAL BOTTLE REVIEW. There are 6 issues from 1974 - June, Aug, Sept, Oct, Nov & Dec. The we have May &June 1977. There is Mar, Apr. & May 1978. These are small magazines at about 5.5" by 8.5" and about 30 pgs ea, well illustrated. SOUTHWESTERN COCA-COLA BOTTLING CO. Bottle Marks & History by Lockhart & Miller. PUBLISHER: [Alamogrordo, NM?]. : [Bill Lockhart]. A deep dive into exact specifications of Coca-Cola and other bottles produced at Southwestern bottling plants during the thirty year period under study. June 1970 issue. Old Bottle Magazine. They no longer. Feldhaus, Ron.The Bottles, Breweriana and Advertising Jugs of Minnesota 1850-1920 Vol. 1: Beer, Soda, Household. Minneapolis: North Star HBCA, 1986. 4to., original full light blue cloth. Minneapolis: North Star HBCA, 1987. This 96 page hardcover book is in good condition. The dust jacket is in poor condition with tears and missing pieces. This handy, go-anywhere book is a combination how-to for locating collectible bottles, and a price guide. Book Title: Picker's Pocket Guide to Bottles. Uncovering the beauty and value of antiques and collectible bottles. This is for 11 back issues of Old Bottle Magazine, all are in excellent condition. But it was only in this century that ‘Stiegel glass’ was finally hailed for its artistry, and only with the appearance of this book, in 1914, that the legend was finally cleared away. Part I [of this book] is Stiegel’s biography. 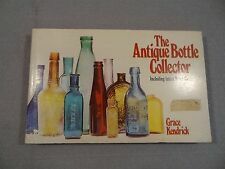 ILLUSTRATED GUIDE TO COLLECTING BOTTLES Munsey 1970 Soft Cover 1000+ Pictures ! By Cecil Munsey. THE ILLUSTRATED GUIDE TO COLLECTING BOTTLES. 1000 Pictures. Soft Cover. A Nice Clean Reference Book for Bottle Collectors~~. You will receive the exact item(s) shown in the pictures. I usually put a ruler in the pictures for size reference. If I see any defects I will show them (any defects missed are accidental). This Distressing Kit is great for any scrapbooker. If you like this item.